It’s a new age out there, people. We’re in the middle of a time when technology, information, and even language is evolving right under our noses. Our global society is trained to want the latest and greatest, and catching up to recent trends is easy to do because anyone can get their hands on and spread new information via the Internet. In fact, that’s how the Merriam-Webster dictionary gets its new additions every year: pop culture trends that gained popularity thanks to the Internet. In 2012, “cloud computing,” “aha moment,” and “earworm” are all words that were added to dictionaries, and they’re now words we use all the time. They’ve become incorporated. However, words aren’t the only things that get incorporated into language—slang is great example of whole phrases being adopted. Punctuation, syntax, structure… everything about language changes over time. But if we’re so willing to incorporate these changes into the ways we communicate with each other on a daily basis, why haven’t they transferred over to marketing practices? As a copy editor, I read a lot of SEO copy. And I’ve noticed that one of the most basic forms of contemporary speech style is often completely ignored. I’m talking about contractions. You know, those words that are really two words smashed together. I’ve been using them throughout this blog post—in fact, I just used another one. 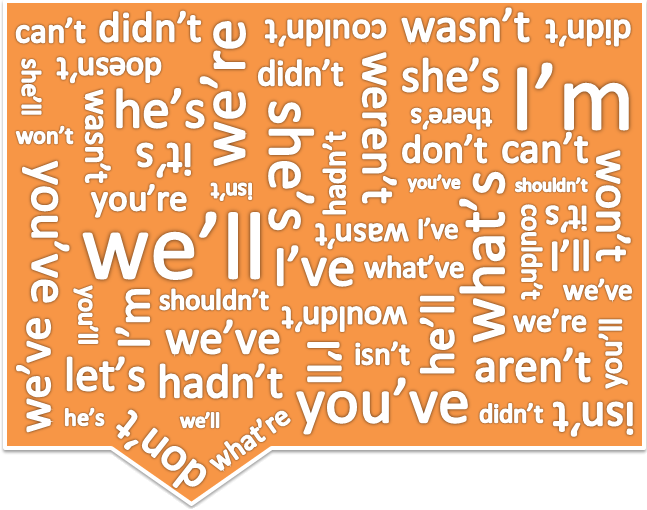 We use contractions when we talk to people every day. They’ve become a natural part of the English language and have even seamlessly integrated into the ways people talk to each other via texting and instant messaging. So why hasn’t it been incorporated into Internet marketing and SEO content writing? Nothing, really. In general, though, contractions are frowned upon because they make writing sound familiar. In SEO, you might find that some clients want formal, technical writing. (And that’s perfectly fine.) But for marketing purposes, writing casually is a key aspect of reaching out to potential clients because it speaks to them in the same way they speak to others. Average SEO pricing depends on the content and the customer’s requirements. See how much easier that read? Your content should be user-friendly and easy to read. Knowing who encompasses your audience and writing specifically for them is the perfect way to reach out and hook someone into what you’re selling. I can guarantee that visitors aren’t going to want to buy from someone who sounds stuffy or robotic. However, in no way am I saying that contractions should be used in every situation. Under no circumstances should inappropriate or outdated contractions (like ain’t or shan’t) be used. You should write your content in a way that makes it easy to understand. If that means using contractions, by all means, use them. Stop being afraid to use contractions. Trust me, they don’t bite. In fact, they often make your content more engaging and user-friendly. Best of all, they help you connect to your audience by making you sound like a real person. After all, isn’t that the true goal of marketing? I completely agree, Kaitlin. Another goal is brevity. Contractions save the reader time and save the writer word count and characters! Thanks, Karen! Brevity is key when it comes to marketing copy, since website visitors are spending less and less time reading while on the web. Are there any other specific brevity tricks that you use when writing? The key to conversational writing is to read your copy out loud. If that’s not the way you’d say it face-to-face, then rewrite it. I absolutely agree about the “reading out loud part.” So many mistakes can be caught simply by reading the sentence out loud for clarity! One of the best things I find about reading out loud (or at least under your breath) is to realize when your sentences become too long. Sometimes you think you have crafted a great sentence with just the exact amount of information. Then you read it aloud. You “hear” now unnatural a sentence with 4 clauses and compound subjects can be. Would you really tell someone in these words? Would you listen to anyone who talked in long, overflowing sentences like that? Probably not. Thanks for the reminder and the excellent blog! Great article! I am a freshman English teacher and the points you mention are ones that I am currently discussing with my young writers.